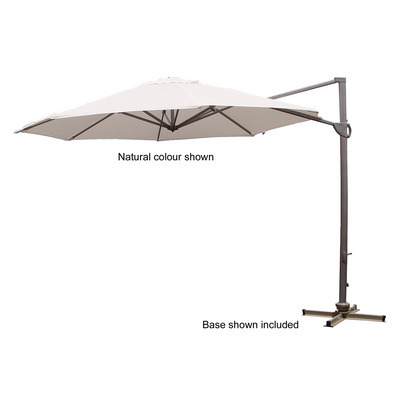 Aluminium Frame cantilever market umbrella with polyester canopy. It has taken years to find a cantilever that we are proud to put to our name to. Crank for easy open and close, foot pedal swivel, one hand operational tilt. With an aluminium frame and polyester canopy. Size 3.3m. Materials: Aluminium|Polyester. Colours Available Supplier: Charcoal|Black|Natural|Forest Green|. Decoration Option: Screen Print|Digital Print. Decoration Areas: Approximately A3 size.